St Mary’s you need to contact the Rector well in advance, preferably before you book your venue for the party afterwards! one of your grandparents were married here. When you contact the Rector he will arrange a date for an initial meeting with you at which he will help you to fill out the Banns of Marriage Application Form and go through some practicalities of which you will need to be aware. Once the completed Banns form is handed to the Rector and a deposit has been paid, the wedding date booking is definite. By law, you must have your Banns read out in church for three Sundays during the three months before the wedding. Banns need to be read in the parish where each of you lives as well as the church in which you are to be married if that is another parish. At St Mary’s, your Banns will usually be called at the start of the 10.30 am service on three consecutive Sundays in the month prior to the wedding. The wedding fee includes use of the church, calling of the Banns, fees for the verger, registers clerk, organist, Diocese and video permission. Flowers and a full peal of bells are not included but can be arranged. We hold a wedding preparation weekend, usually around St Valentine’s day. On the Saturday all couples will meet together with the Rector, and a married couple of St Mary’s hosts the event. The morning service on the Sunday is a special one that focuses on human and Divine love. This weekend will help you in the preparation for your wedding. From the moment you apply for your wedding to be solemnised at St Mary’s, our church family includes you and your families in their prayers. St Mary’s offers flower arrangements as optional extras at very reasonable prices. The flowers will be in neutral wedding colours of white and cream flowers with mixed foliage. The quality of the flowers provided is very high. If you wish to discuss the flower arrangements please contact Jenny Bennett or call 07534 899199 (text / voicemail). The date and time for a rehearsal will be agreed with the Rector. It usually takes place 2 to 5 days before your service. The rehearsal will last between 45 and 60 minutes. For the rehearsal we will need you both to come, and if possible your best man, and bridesmaids too (or at least one of them, so she can explain to the others). The person who gives the bride away, usually her father, is also welcome. If parents or other relatives would like to attend they are welcome, though as spectators only. Ushers are welcome if they would like to receive instruction about what to do during the service. All these people are welcome at the rehearsal but their attendance is not essential. It is our practice to take a collection at weddings. These collections are divided equally between the maintenance of the church building and a registered charity chosen by the bride and groom. Many couples are particularly pleased to have an opportunity to help some cause close to their hearts at the time of their own special happiness. It would be good if you gave some thought as to which charity you would like to support. Please inform the Rector about your choice at the rehearsal. Your chosen charity will be announced at the wedding service. Although you are very welcome to use our church hymn books, most couples make their own printed Order of Service with the hymns printed in full. If you intend to have a printed service sheet the draft must be checked with the Rector before printing. Please do so in plenty of time. If you have special requests for the music at your service, discuss it with the Rector who will put you in touch with the Director of Music, Graham Wadley. In addition to your Order of Service, the church provides a booklet with all other texts for your wedding service which all who attend will receive and be asked to hand in after the service. Do not worry too much about your Order of Service as we will discuss this fully at the preparation meeting. As taking pictures during the service is very distracting, no photography is allowed during the service (from the words of welcome by the priest until the final hymn). Only if it has been agreed with the Rector will the photographer be allowed to take pictures from the back (near the baptism font) during the vows and the exchanging of the rings, but flash photography must be avoided. Professional photographers are familiar with these arrangements but if you are not using a professional please inform yours of these regulations. It would be embarrassing if the priest had to interrupt the service to repeat these stipulations in the middle of the service. If it is your wish, a person either officially hired by you or a friend/relative may be allowed to make a video of the ceremony on condition that this person remains in a static position throughout the service, either near the organ or behind the choir-stalls on the opposite (South) side in order to be unobtrusive. If you will not have a video, that part of the fee will be refunded on request. The request should be made to the treasurer. If your wedding is followed by another wedding, we can only allow a maximum of 30 minutes for photographs in the churchyard after you leave the church. So, for example, if your wedding is at 1.30 pm, you would leave the church at 2.15 pm, photographs to finish by 2.45 pm. The wedding party for the 3.30 pm service would then be assembling. You will also need to ask two witnesses, one on behalf of the groom and one on behalf of the bride, to sign the register after the service. These persons can be relatives or friends, as long as they are 18 or over. For obvious reasons confetti is not allowed in the churchyard. Bio-degradable confetti may be used when leaving the churchyard as long as it does not end up on the graves. 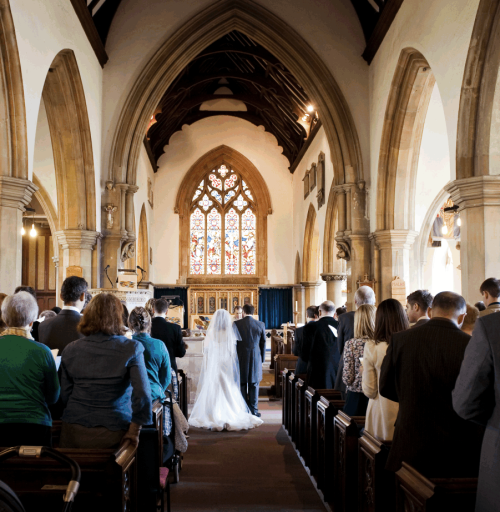 The Church of England general wedding page and the Chelmsford Diocese Marriages page. Main picture by Justine Ferrari.